Are UK Natural Hair Subscription Boxes Worth It? They are great value for money, you get full-sized products, from amazing independent and international brands. But this post would be short and pretty useless if I left it at that, so we will get into my experience with Curlee Box, my thoughts on natural subscription boxes as a whole and we will get into what I consider to be some of the pros and cons. What Subscription Boxes Are Available? If you want to know what black owned subscription boxes are available, have a look at my post – UK Black Owned Subscription Boxes for a list of beauty, lifestyle and hair related subscription boxes. As shopping for natural hair care products can be expensive at times, subscription boxes have been created to give us the products and big names we want at a smaller price. Natural hair friendly subscription boxes create a sense of community. Both Treasure Tress and Curlee Box have done an amazing job at creating a safe space for naturals to come together, especially Treasure Tress with their Teen Experience and various other events across the UK. The UK still doesn’t have the best access to products that are in the US, these boxes bridge the gap and bring those products straight to our doors, making it easier to use and discover new products from across the pond. The two main natural hair subscription boxes that I am aware of that are available in the UK and elsewhere are: Curlee Box & Treasure Tress. I know Dominique the founder of Hair Popp & Melanin Mind Soul has put together a post on some services that provide boxes, you can read more about that here. > Treasure Tress accommodate products for a full wash day, so you will receive a cleanser, deep conditioner/conditioner and styling products. > Curlee Box typically will have a full range of products in their boxes for example their recent April box had products from Cream of Nature’s New Pure Honey range plus the New Gold Eco Styler. Generally I would say that these two subscription boxes are great for those who are newly natural, if you’re unsure what products to try, what brands to try and if you want a way to try a few different products at a time. I definitely think if you’re someone who doesn’t buy many products then subscription boxes may not be for you. It may be overwhelming to be receiving a few products every month without really needing them. Also if you’re a beauty/hair blogger and want some consistent hair content, subscription boxes can help with that. Whether it is unboxing videos on your Instagram/Youtube or blog reviews you know you will have one topic covered for the month or if you want to just try it out once you can do that and share your first impressions. I also wouldn’t recommend them for those who like to create their own products, as you tend not to receive DIY products, but you never know now that I have spoken on it you may just get a Make It Yourself Box in the future. You’re paying a small price for a box full of hair products. In my opinion yes they are worth it, especially if you are one of the types of people I mentioned earlier. 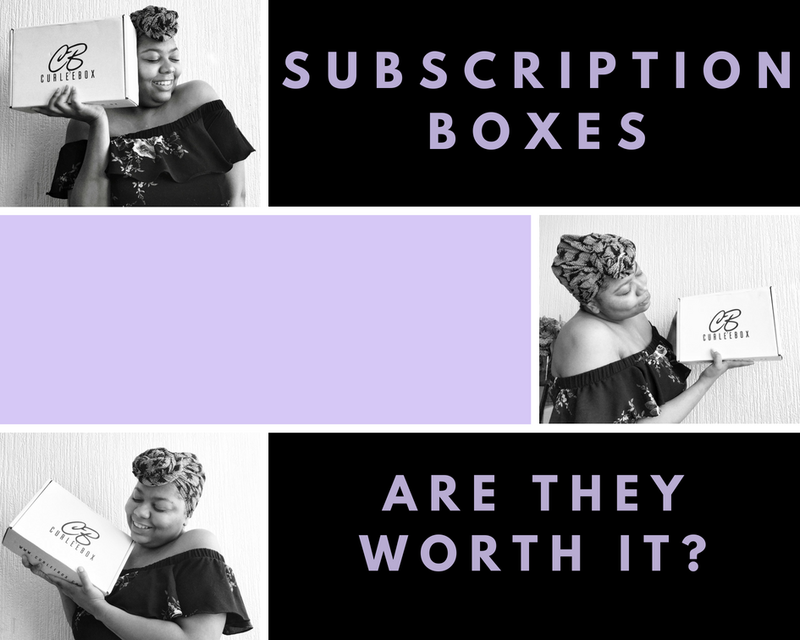 If you want a smoother journey during your transition and a bunch of people to connect with during the journey then jump on the subscription box train. Both boxes are available internationally, so for anyone within Europe or outside of Europe you can also join in on the fun. Treasure Tress – £20 not including PP and it does also depend on where you’re purchasing the box from. Curlee Box – £20 not including PP and it does also depend on where you’re purchasing the box from. I hope you found this post useful and you are now able to make a decision on whether or not subscription boxes are for you. If I missed anything feel free to drop me a message on my socials or contact Curlee Box & Treasure Tress, they would be happy to answer any questions you have. I’ve had both boxes and loved them, but got overwhelmed with so many products on top of my product junkie ways, that being said you raise a valid point when it comes to having a reason to stay consistent on social media. I have the issue that can spend months inactive for no reason, having an unboxing monthly as you point out could really help to stay active at least once or twice a month! Thanks for the post.